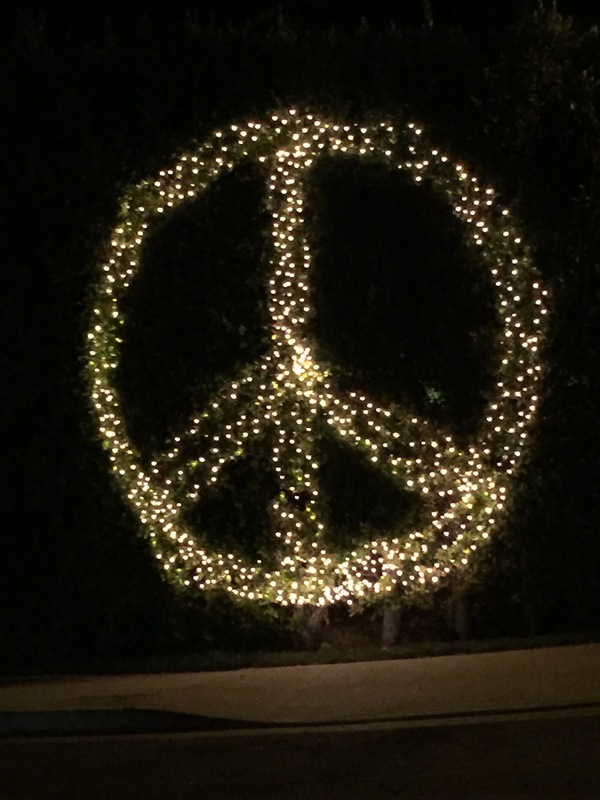 This holiday season my neighbor put up a 15 foot high lit peace sign on their front hedge for all to see. It became a daily reminder of the turbulent year we are now leaving behind and to remember what is really important to each and every one of us—PEACE IN THE WORLD. This is what we should all strive for. It means tolerating differences and getting along with family and friends, other religions, cultures and/or countries. We are all human angelic souls trying to learn and evolve. Fear, aggression, guns and war are not signs of evolving. Difficult as it may seem, we have to help those who are struggling with the belief that these methods are the only way. And in the process, we have to stand up for TRUTH and what is right in a sea of deception. 2016 is a “9” year in numerology, meaning completion. It may be a difficult and challenging year as we, as the human race, wrap up loose ends in all areas of our life and the world at large. But there is always something positive to reach for. The numerologists say that “9” also symbolizes Universal Spiritual Laws, the concept of karma, spiritual enlightenment, spiritual awakening, service to humanity, humanitarianism, leading by positive example, philanthropy, charity, self-sacrifice, selflessness, destiny, life purpose and soul mission, a higher perspective, inner-strength, responsibility, intuition, and strength of character. All our higher qualities and destiny crossroads. What will we choose? Since the number 9 resonates with learning to say ‘No’ and Divine inner wisdom, it should be quite a year. Wishing you all a very Peaceful and Loving New Year! If you’ve ever been to Egypt and visited the Temple at Abydos, then you’ve heard of the amazing story of a woman whose memory of a former life helped 20th Century Archaeologists uncover lost Egyptian history. Her name was Dorothy Eady (later to be called “Om Sety”) and her story is perhaps the most famous reincarnation case ever heard. I’ve been to Abydos, Egypt twice. It is by far the temple I most resonate with, being home to the Ancient Egyptian Mystery Schools—so it’s not surprising that her energy lives on there. “I was born in London, England in 1904, and was christened Dorothy Lousie Eady. My father was then a Master Tailor. Neither he nor my mother had any interest in Egypt, ancient or modern. “When I was three years old, I fell down a long flight of stairs and was knocked unconscious. The doctor was called; he examined me thoroughly and pronounced me dead. About one hour later he returned with my death certificate and a nurse to ‘lay out the body,’ but to his astonishment, the ‘body’ was completely conscious, playing about, and showing no signs of anything amiss! 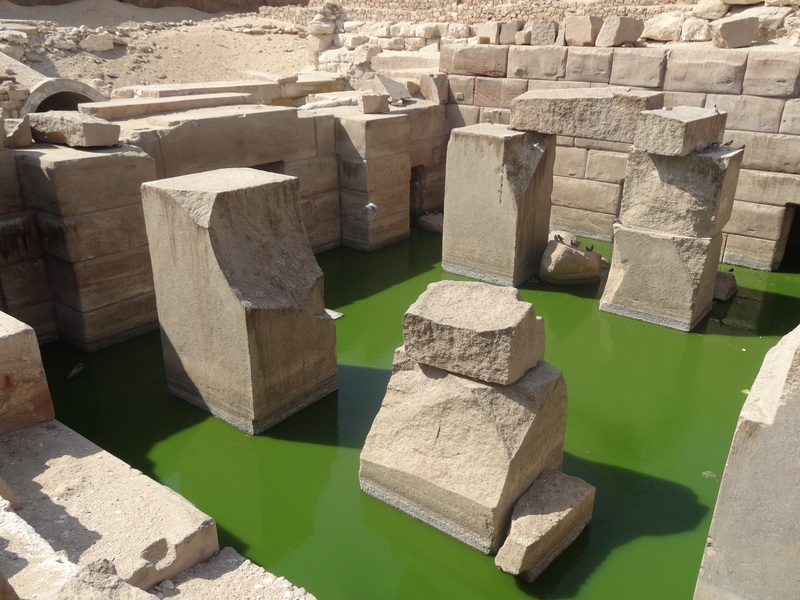 “Soon after this accident, I began to dream of a huge and lovely building (which later I found out was actually the Temple of Seti I at Abydos). On waking, I would cry bitterly and beg to be allowed to go home. This longing to ‘go home’ became a joke in my family, and I was assured that I WAS at home, but I was equally sure I was not. “When I was four years old I was taken to the British Museum in London as part of a family party. Mother said I paid no attention to anything until we reached the Egyptian Galleries. Then I went simply crazy, running about and kissing the feet of all the statues that I could reach. When the family was ready to leave, Mother said I clung to a glass case containing a mummy and screamed, ‘Leave me here, these are my people.’ She was so surprised that she never forgot the incident. “When I was six years old I saw a picture of the Temple of Seti I at Abydos, in a magazine. I recognized it at once as the place I had always dreamed about, but was puzzled because the photo showed it to be somewhat ruined. I showed the picture to my father, told him that it was my home, and that I wanted to return there. Of course, he told me not to talk nonsense. He told me that it was an old temple in a country called Egypt, and that I had never been there in my life. 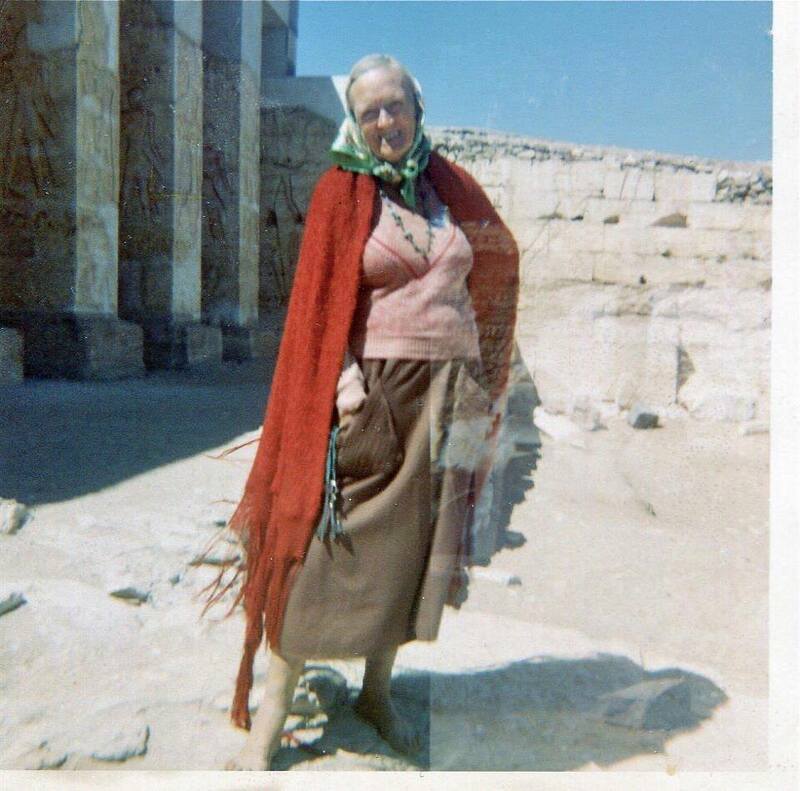 Dorothy Eady would continue to pursue her obsession with Egypt. She worked for an Egyptian interest magazine in London, where she met a young visiting Egyptian student. They married and she followed him back to his homeland of Egypt where they had a child she named “Sety.” As a married woman with a child, she acquired the respectful title “Om Sety” (meaning, mother of Sety, her first-born child). But the more interesting part of Dorothy’s story, which Dorothy only revealed to Dr. Selim Hassan and a few chosen others, was that not only did she remember her previous life in Egypt, but at night she would be visited by the solid-appearing spirit of the Pharaoh Seti I. And more astoundingly, there were others that witnessed a tall kingly like figure standing at the foot of Dorothy’s bed at night. So who was Dorothy Eady in a past life to merit nightly visitations from the spirit of a famous, yet very dead, pharaoh? Dorothy claims her name during Ancient times was ‘Bentreshyt’. She came from a poor peasant family who gave her in offering to the Temple at Abydos when she was a young child to be tutored in the ways of the priesthood. Abydos is in northern Upper Egypt and has been a sacred site to the Egyptians since predynastic times. Abydos is the cult center for Osiris, god of the dead. In the temples of Abydos, an initiate’s training was a process that took many years, requiring many tests of moral strength, character, and service. Dorothy recalls, as Bentreshyt, spending many hours of quiet contemplation in a beautiful tree-filled garden at Abydos. One day the Pharaoh Seti, who built the Abydos Temple circa 1300 B.C.E., came to call. He saw the young initiate in the garden and struck up a conversation with her. Whenever he would visit the temple he would seek out Bentreshyt, and over time the two developed a close relationship. Eventually, they became secret lovers, something forbidden to a temple initiate. The inevitable happened and Bentreshyt became pregnant. When she was brought before the temple priests, she refused to reveal the name of the child’s father. She feared telling anyone it was her true love, the Pharaoh Seti. Before Seti could learn of her pregnancy, Bentreshyt committed suicide to protect her secret. The next time Seti visited, he inquired about the whereabouts of his young love. He was informed she was gone and nothing else. Apparently, as the story goes, Seti grieved the sudden loss of Bentreshyt. He vowed to search to the ends of the earth to find her again. And Eady claims he visited her up until her death in 1981. It’s certainly a tragic, yet romantic, love story. But because of these nightly visitations in this life, she was able to fill in some important historical gaps about not only Seti I, but the life and times of this Ancient Egyptian period. Om Sety (aka Dorothy Eady) went to Abydos for the first time, in this lifetime, in 1956 when the temple was under much-needed restoration. Her first visit to the temple was upon her arrival at night and no electrical lights were available. She told the guard on duty she didn’t need lights. She knew where everything was and then proceeded to give him a tour in the dark, pointing out every chamber, its name, as well as identifying each of the seven sacred chapels dedicated to a specific god. She even told him where the gardens used to be, which were no longer there. They didn’t believe her until they started digging up the area and found the tree roots just as she had described. Om Sety would spend the remainder of her life as a caretaker of the temple, helping in the restoration process, giving dignitaries and archaeologists alike personal tours. No one knew the temple better than Om Sety. Yet, they say, she was always pressing the temple walls and stones, looking to open hidden chambers she said were once there. The interesting thing about Om Sety’s life, which is not talked about in books such as Jonathan Cott’s, “Search for Om Sety” or even in her own autobiography, “Om Sety’s Abydos,” is that her destiny had already been pre-set to some degree by the High Priests of Abydos who were expert seers unto the Temple of the Prophets. The High Priests knew she would fall in love with the virile pharaoh and would have a child by him. They knew she would never become a full-fledged initiate into the priesthood. They also knew that she would eventually choose to take her own life, and that she would forever be drawn in future lifetimes to the temple where she experienced such a deep love. The High Priests knew that on a soul level Bentreshyt had agreed to be the future caretaker of the Temple at Abydos—to honor both its heritage and its sacred secrets. In this respect, Om Sety appears to have made good her soul’s purpose and mission. The Temple at Abydos, along with the Temples at Saqqara, were the primary homes of the great Mystery Schools of Egypt. Seti I erected his own temple over an existing, even older temple, making it automatically a “sacred temple.” Each Pharaoh would aspire to have either a real tomb or a symbolic “fake” tomb built there for himself to insure his entrance into the afterlife. Why? One reason might be hidden in plain sight. Atop a high temple beam at Abydos, which was discovered in the early 1900’s, is the infamous stone symbols of a helicopter, submarine, and a spaceship. The futuristic symbols have often baffled Egyptologists. Some claim these strange symbols are the result of later pharaohs (after Seti I), carving over old symbols, as they sometimes did to put down their own name instead, thereby distorting the original image. But there is no evidence of this on the stone slab in question and the beam is so close to the ceiling, most people never even see it. Did the pharaohs all know about this natural portal? 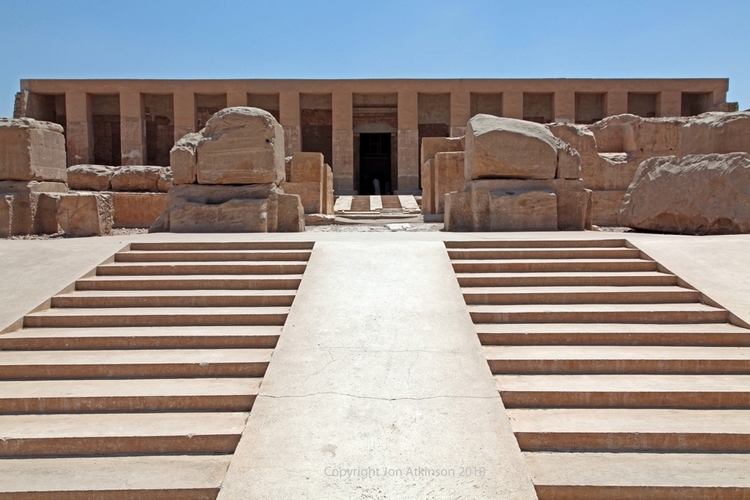 Ramses II built a temple 300 yards northwest from his father Seti I’s temple at Abydos. 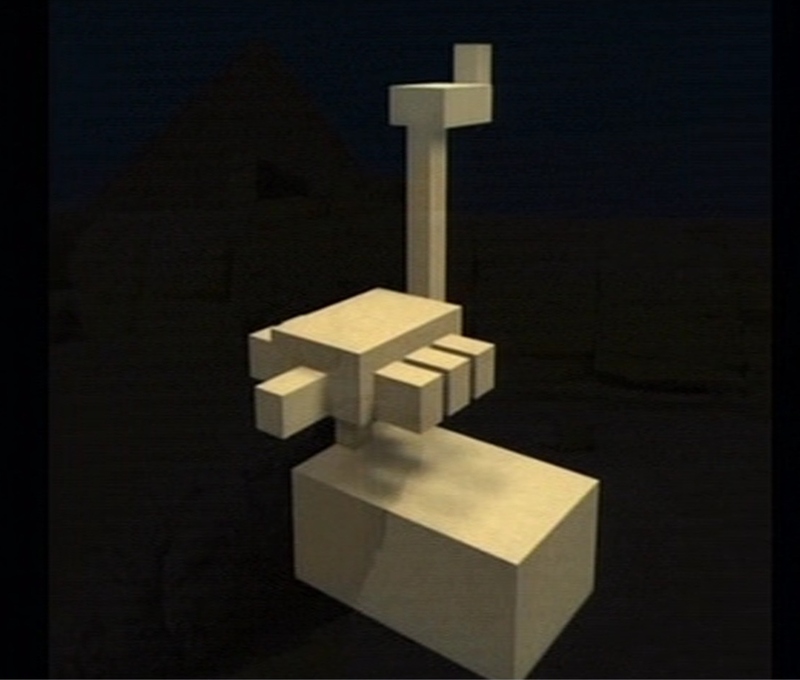 No one knows why it is mysteriously referred to as the “Portal Temple.” More recently, “Abydos” is referenced in the 1994 “Stargate” movie and even in video games of the same nature. 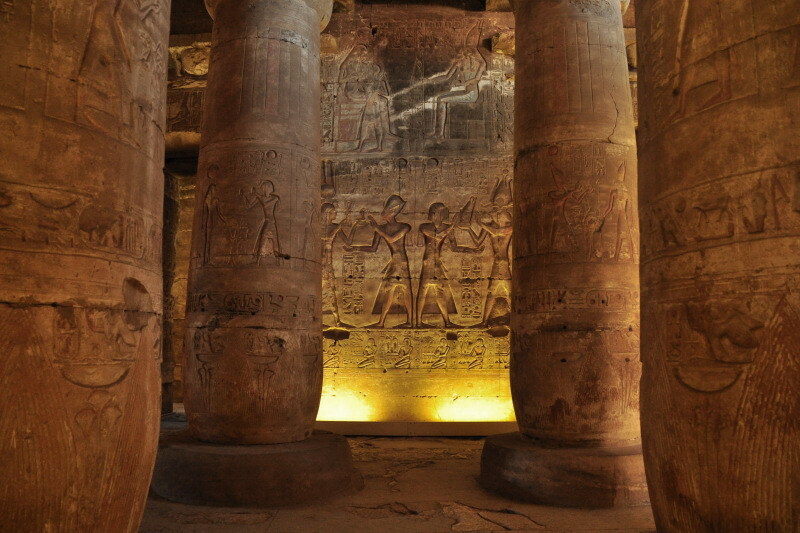 Is it any wonder the Ancients considered Abydos the most sacred temple in all of Egypt? The interest never seems to wane regarding Ancient Stargates and portals. Fimmakers are now in production to do a remake of the Stargate movie, in trilogy form. This particular Stargate portal was protected by the Mystery School Priests of Egypt, long before Seti I built his temple at Abydos. This portal provided time travel capabilities and knowledge of the future, which might explain the mysterious futuristic aircraft symbols seen on the ceiling wall beam. Using this portal technology is how the High Priests verified the future destiny of the reincarnated initiate who would one day become famous as “Om Sety,” and also why Pharaohs built their tombs at Abydos to insure their entrance to the stars after death. 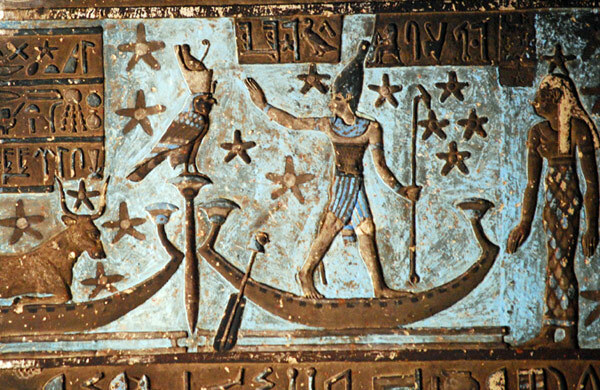 It is interesting to note that cosmologists have pointed out that the many temple drawings of Egyptian boats, always seen as carrier vehicles to the heavenly stars, have the odd shape of what today’s scientists say look exactly like wormholes in space. They have trumpet-like openings at each end and hardly look like sea-worthy vehicles. Did they represent portal streams to the universe? These depictions on the walls of Abydos and other Egyptian temples is always linked to the astrological stars and the quest for the “after” world. Perhaps, what they really were trying to show us was the pathway to an “other” world in time and space. The Abydos Stargate is part of the Osirion, a building that pre-dates Seti I’s temple. For centuries the Osirion was buried under layers of sand, protecting its secrets. It’s still partly underground and now flooded with green water. 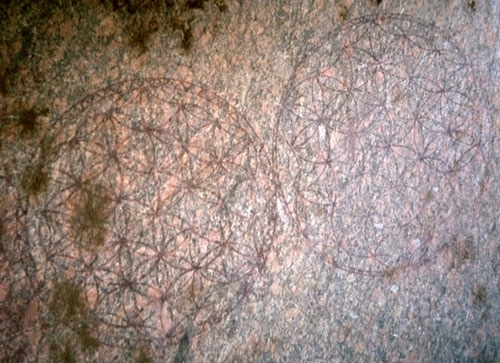 There is an unusual double laser-infused “Flower of Life” pattern on one of the granite walls. It’s not carved or burned into the stone—it’s lasered on, telling us it was done by advanced tools. This is the oldest example of sacred geometry found anywhere, to-date. Other examples can be found in Phoenician, Assyrian, Indian, Asian, Middle Eastern, and medieval art, but not laser stone cut. The Flower of Life is the symbol said to contain the blueprint of creation and the fundamental forms of space and time. It is the visual expression of the connections of life that runs through all sentient beings. The adepts of the Mystery Schools of Egypt knew and understood these universal truths. We are only now beginning to rediscover them again. We may even discover that many of the sacred temples around the world, often said to be built on energetic Earth ley lines, may actually hide other portals into space and time that the ancients knew about. I guess it’s only a matter of time, but what an exciting time it’s bound to be. The Ancient Egyptians had a saying: “As above, so below,” meaning that man is the counterpoint of God on Earth. To look without, is to look within man. This was believed to hold the key to all mysteries. To understand the chambers inside the Great Pyramid is akin to looking at an evolutionary timetable for man itself. New discoveries are being unlocked as man is being filled with the Light of Consciousness and Cosmic Awareness. The King’s and Queen’s Chambers did not initially have such mundane names. 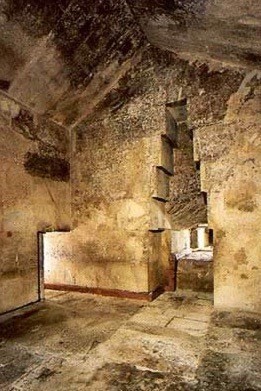 Long ago these chamber rooms were seen as “temples” because they were pathways to the sacred knowledge of the universe. They were the Temples to Inner Man. Oftentimes the Queen’s Chamber is seen as the poor second cousin to the King’s Chamber, but what many do not know is that the Queen’s chamber was “control central” for the pyramid. Think of it as the switch/relay room of a dimensional access station. From this chamber, electromagnetic fields were directed up from the depths of the pyramid through the King’s Chamber and straight to the gold capstone and sun crystal that was once positioned atop the pyramid like a powerful antenna. Both the King’s and Queen’s chambers have shafts that are aligned to certain star system coordinates in the cosmos. The Queen’s Chamber has two shafts that were bricked over, but uncovered in 1872. 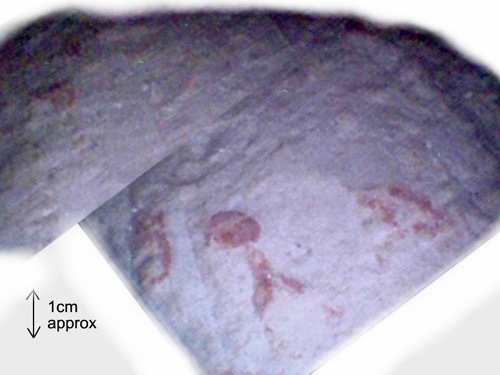 They can be found on the north and south walls of the chamber and are aligned with the Orion Constellation. While this fact is well-known, little is understood of the shafts’ true purpose. In 1993 German engineer, Rudolph Gantenbrink, sent a robot called Upuaut2 (Wepwawet – “the opener of the ways”) to video the inner walls of these shafts. He discovered that the southern shaft ended with a small limestone slab in which two heavily corroded pieces of copper had been inserted. The door is estimated to be about six centimetres thick and is only about six meters from the outer surface of the pyramid. Gantenbrink tried to video the northern shaft, but couldn’t get around the curve. 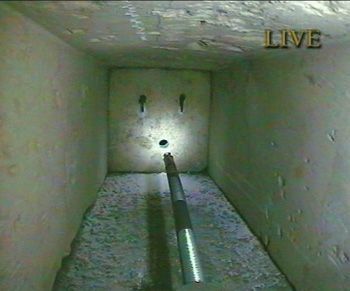 In 2002, a National Geographic robot, inserted a miniature fibre-optic camera into a three-quarter-of-an-inch hole to reveal a rough-hewn blocking stone about 21 centimetres beyond the original southern shaft door. It appeared to be covering a cracked surface that was sealed over. A similar discovery was also made in the southern shaft of the Queen’s Chamber. What does it mean? The only clue is the strange symbols on the other side of the shaft door which the camera recorded through the bored hole—not hieroglyphics, not Sumerian, but a language which is unknown and undecipherable to those unable to read it. These shafts are very important. While the Great Pyramid had multi-purposes, its most important function was as an inter-dimensional teleportation device (also known as an “Ascension Chamber”). 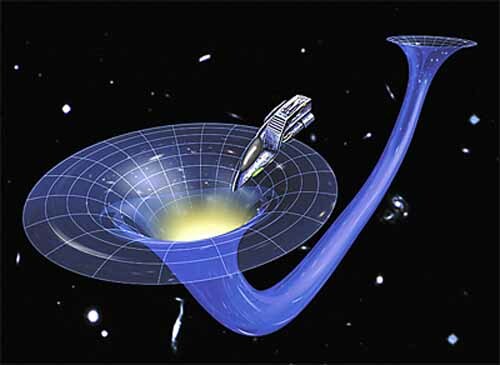 During that time, some very advanced souls had learned how to create wormholes in spacetime to connect with the wisdom of the universe. These hidden shafts, which only advanced robotics, much like we have today, could access, were intentionally sealed up at one time. They had a unique purpose. They were like runways to a cosmic airport for those who had mastered Light Transfiguration, the ability to send their ethereal bodies to higher dimensions. According to remote viewer, clairvoyant and author EM Nicolay, the strange writing seen on the shaft wall does not contain any profound message for humanity by some alien race. The writing is actually instructional coordinates, much like today’s airport runway symbols which give path directions. These directions also tell the journeying soul how and when to “push through” to transverse specific higher dimensional areas of the cosmos. This is not as surprising as it may sound. The Ancient Egyptians were big on how-to instructions to access the stars even after death, as evidenced from inside funerary coffins. While some may balk at the possibility of the Ancients having teleportation technology, this science is not new. The U.S. government has already successfully experimented with teleportation and time travel, compliments of the inventor Nikola Tesla, who developed a teleportation device before he died. This device became the secret U.S. military DARPA program known as Project Pegasus. It was actually the Ancient Atlanteans who brought this “ascension” technology with them to Egypt just prior to the Great Flood that would bring down Atlantis (see Part 1 and Part 2). Unfortunately, much like DARPA, this knowledge got into the wrong hands during the reign of the Pharaoh Akhenaten, where the powerful and mighty Amun priesthood sabotaged it in order to control universal access. Their tampering, under the guise of being helpful, trapped some souls—leaving them in a state of dimensional limbo unable to return or ascend higher. It was Akhenaten who had the Great Pyramid’s gold/crystal capstone removed, rendering its energy and purpose virtually useless. At the same time, he dismantled its functional components and closed down all passage ways into the Great Pyramid—an act that would seal it off for thousands of years. It’s only been in the last 50 years that much of these discoveries inside the pyramid have resurfaced. We are once again, like in ancient times, reaching an evolutionary time unlock period where Light is streaming forth from the cosmos and awakening us prior to a 5th dimensional shift. Are we ready for it? In our own way, we are all preparing for this transition. Recently, I led a small group of eight people into the King’s Chamber for two hours of private time in the early hours of the morning prior to dawn. We each brought with us a pitch-pipe. In unison we tuned ourselves to the tone “A,” which is the frequency of the pyramid and the sarcophagus. As we took turns laying down and meditating inside the sarcophagus, the others moved around it in a procession doing harmonic overtones and “Omming.” The energy was so intense in the chamber, we could feel our bodies vibrating in resonance. Down below, in the Grand Gallery, the one lone guard on duty later would tell us that our voices reverberated throughout the pyramid, sounding like a heavenly choir. One can only imagine what the energy would have been like during ancient times when white limestone encased the outside of the pyramid and the gold and crystal capstone set up a powerful directional energy field. Even without it, it was easy to feel one’s physical body transport into time and space, while bathed in the resonance of this “temple”. Before we left, we all stood together inside the sarcophagus, lined up like the chakras in the energy body, and formed a silent prayer for all our brothers, near and far, on all cosmic dimensions. For some in our group it opened memories and helped in healing. It was a transformative experience on so many levels—which is really what the ancients always intended it to be. Peace and Namaste to all. More unusual articles on Egypt are coming. Subscribe free to the Trinfinity & Beyond Blog. It is no secret that beneath the Great Pyramid are vertical shafts, tunnels, hidden chambers, and even a subterranean lake. To find underground water in a dry desert area, where there shouldn’t be any, is intriguing. Tourists don’t get to see the more interesting lower depths of the Great Pyramid which, due to accessibility problems, has kept important secrets safe for thousands of years. There are layers of shafts that lead straight down through solid limestone, much like the tunnels seen in the tombs of the Valley of the Kings, where the Ancient Egyptians buried their dead and hid from ordinary man vast treasures. Once you get past ground level in the Pyramid, there is a second layer shaft which descends to a court flanked on both sides by seven chambers. 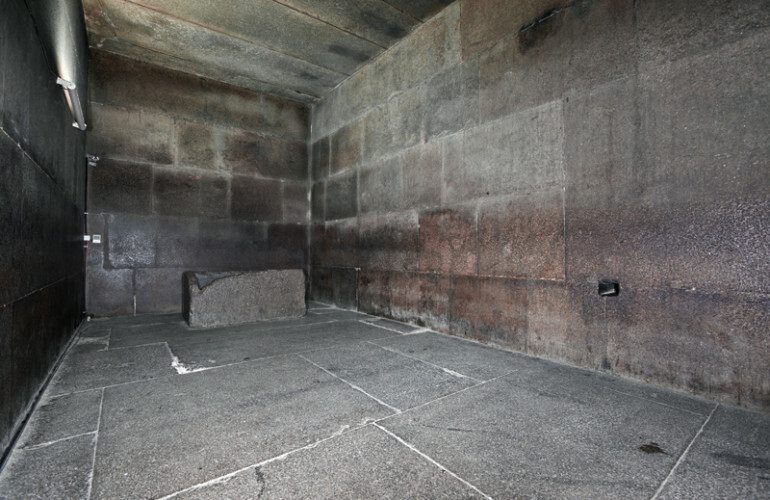 Some of these chambers contain huge sarcophagi of basalt and granite, 18 feet high. There are no carvings on the stone to tell us who its owner may have been or its purpose for being there. These sarcophagi were allegedly open and empty when found. 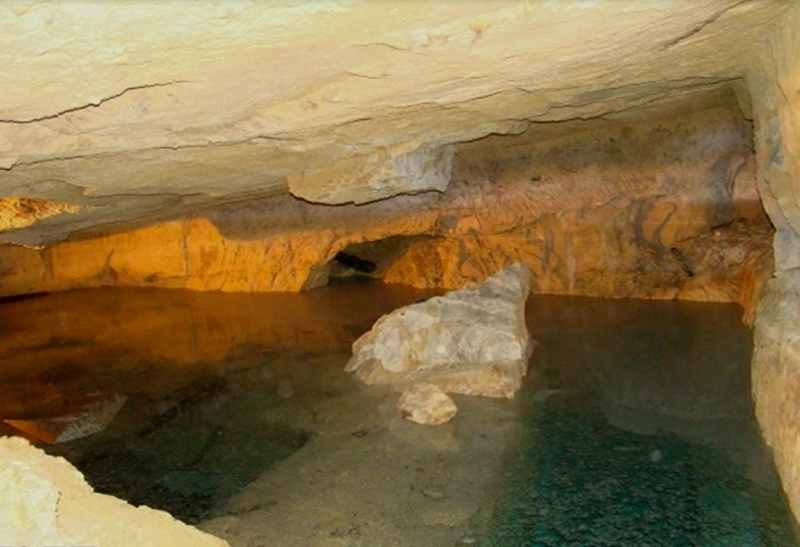 Down an even narrower shaft, to a third and even deeper level 95 feet down, lies a clear subterranean lake containing a submerged blue stone sarcophagus about 9 feet in length and weighing between 11-12 tons. 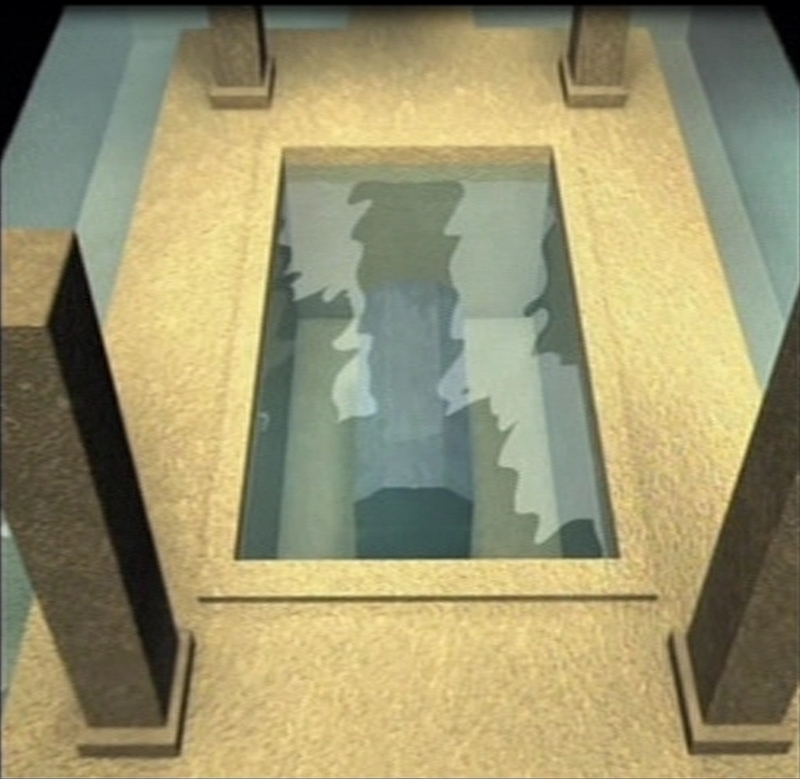 Surrounded by four pillars (which have since been removed), the chamber was said to be the “Tomb of Osiris” by Dr. Zahi Hawass, the Director of the Giza Plateau back in 1997-1999, when they first discovered it. How it got down such narrow shafts is an even greater mystery, as no other entrances have been found. 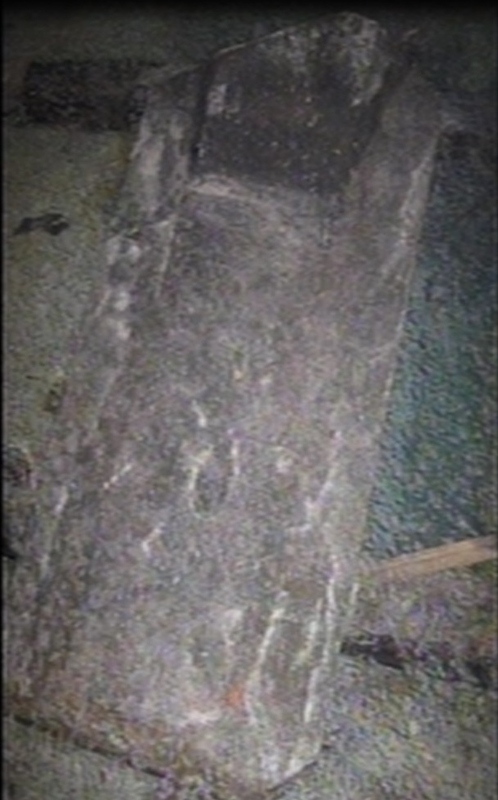 The Egyptian government claims they extracted this sarcophagus and found it empty, but there are no videos or pictures anywhere to be found of them actually unsealing it. In this day of mass media promotion and documentaries on almost everything, it’s pretty hard to believe they would pass up such an extraordinary opportunity. We do know that they supposedly carbon dated the sarcophagus and found the results completely challenged accepted Egypt chronology about the Pyramid’s age. Even that news went completely silent. This major discovery happened in the late 90’s, yet no new update has ever been made public on the alleged “Tomb of Osiris.” There are good reasons. I am quite certain the Egyptian Department of Antiquities will not find the God Osiris nor any other being inside. Why? Because this particular sarcophagus is virtually impossible to open. I remote viewed the submerged area and found the sarcophagus to be impenetrable, so I contacted expert remote viewer, clairvoyant, and author, EM Nicolay, who is extremely proficient at these sort of things. Not knowing my lack of findings, he confirmed it had never been opened, but provided further information I wasn’t privy too. It appears the sarcophagus is “genetically sealed,” meaning that no man can open it unless his or her DNA matches the genetic coding intentionally locked in place. The Ancient Atlanteans, who brought their advanced knowledge to Egypt (read Who Really Built the Great Pyramids – Part 1), apparently devised a fail safe method, much like our iris scans or fingerprint security locks do today, but much more sophisticated. Pretty clever using DNA. Archaeologists report that the sarcophagus sits in cold clear water that sizzles when objects fall into it. Understandably they avoided physical contact, assuming it contained some caustic ancient substance. Yet, the water wasn’t always there. Due to the strange properties of this particular sarcophagus, a flooding of magnetic energy occurred when it came in contact with water and somehow charged it, creating an additional level of protection. Whether accidental or intentional in design, it only adds further to the mystery. It’s obvious there is something very important inside the sarcophagus to warrant such safeguards. Nicolay reports that it contains a major planetary entrance to a dimensional portal. This particular portal is a key stargate that anchors our entire planet, much like a “Divine Engine.” Could this be the true entrance to the Hall of Records which the sleeping prophet Edgar Cayce predicted would be found, but could only be “unlocked” by a select few? If so, no archaeologist has, thus far, displayed the right genetic code to crack it. While present day archaeologists are still trying to figure out how to open this sealed container, it may be a futile task. Unfortunately, the beings with the correct genetic codes to open it are no longer present in this world. One of these beings would, in fact, have to incarnate to accomplish this. To understand how this genetic coding all came to be, one has to first go back to the time of Atlantis (as I referenced in my previous blog). I will attempt to give a brief overview in order to shed light on man’s rather complex history. Before the third and final upheaval of Atlantis, there existed two major ruling parties on Atlantis—The Order of Melchizedek (also known as the Sons of the Law of One), which had 12 members (like Senators), and the Sons of Belial (sometimes referred to as Baal) which also had 12 members. Each group knew how to use the spiritual truths of God and the forces of Nature, but the Sons of Belial used this knowledge for the material gain of physical power and service to self, whereas the Melchizedek followers believed that it should only be used for service to others. A continual struggle regarding man’s proper use of advanced technology and universal knowledge existed between these two opposing parties. (It’s the age old battle between the forces of Darkness and the Light.) These differences led to the misuse of advanced weaponry by the Sons of Belial for the purpose of ridding areas of the Earth from an overpopulation of large animals (the dinosaurs). The Belial followers ignored all safety warnings, which consequently caused a planetary shift, massive flood inundation, and thousands of lives being lost. Before the final upheaval, Atlantis had many colonies or “outposts” spread throughout the world (i.e, China, Latin America, India, Mongolia, Egypt, etc.). Egypt was their principal outpost and it was here that the Atlantean entity known as Thoth, the “Lord of Magic and Time” (aka Enoch), traveled before the Great Flood (now known as the Biblical flood of Noah), to preserve the knowledge of Atlantis before it was destroyed. All 12 members from the Order of Melchizedek were dispersed to outposts in other parts of the world to also secure the sacred knowledge. The Mayan civilization was one of these outposts, and from the Atlanteans they would inherit celestial and “timekeeping” knowledge. There were survivors of the Sons of Belial who set up their own habitation areas on Earth after the Great Flood, but the Sons of Belial and the Order of Melchizedek weren’t the only two groups to have staked out new territories. There was also the Anunnaki. The ancient Sumerian texts referred to them as the “Gods from the sky.” The Bible refers to them as the “Nephilim” or “fallen angels” who came to Earth and mated with humans. Most of these “god” myths are not myths at all. The Anunnaki were an extraterrestrial race that came to Earth and put down roots in Mesopotamia. They were responsible for the advanced Sumerian civilization that suddenly sprang up out of no where. This ancient Assyrian land (today’s Iraq), has always been seen as the “cradle of civilization” because of the Anunnaki influence. 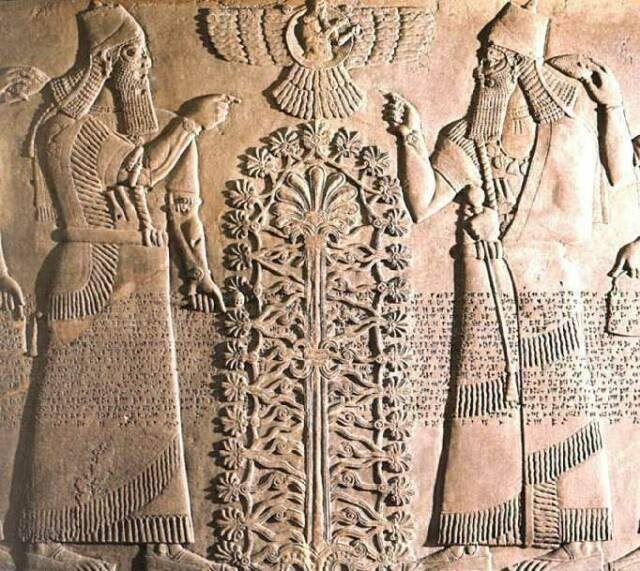 The Anunnaki changing the genetic tree of life. The Anunnaki were technologically advanced, yet their primary interest was mining Earth’s gold resources in the African mines. To do so, they needed lots of workers which their own people would not provide. To fulfill their labor need, they employed genetic manipulation and in-vitro fertilization techniques to create a new breed of hybrid workers that came from their bloodline, but were essentially slaves. The idea of ET genetic manipulation may sound preposterous to some, but just recently long-time researchers in the Human Genome Project stated that they now believe “the so-called 97% of non-coding sequences in the human DNA is nothing less than the genetic code of extraterrestrial life forms.” While science no longer finds this theory far-fetched, Nobel Prize winner of DNA fame, Sir Frances Crick, has always espoused the belief of our extraterrestrial origins. Several races sprang forth from the Anunnaki genetic experiments—-the Arabs, the Hebrews, and the 12 Tribes of Israel. This would forever set the stage for undercurrents of resentment and persecution for centuries to come, especially when the Anunnaki left and the Hebrews were then taken into slavery by the Egyptians and Babylonians. One can begin to understand the conflict over the centuries between the races in the Middle East and the rest of the world. The roots to the Anunnaki and the disruptive energy of these areas runs deep, as we can still see today. There are those that have clearly taken advantage of this for the control of people and lands. While certain civilizations tend to whitewash their history, as man oftentimes does to make himself appear good and righteous, the Anunnaki saw themselves as all-powerful and had no qualms about destroying those who might interfere with their legacy. When an influx of Atlanteans came into their lands after the Great Flood (approximately 15,000 – 13,000 BCE), the Anunnaki waged a war for territorial dominance. The Sons of Belial quickly sided against the Melchizideks and joined ranks with the Anunnaki who, like themselves, were more interested in material power and gain. A sky war was waged with “fireball weapons” that decimated thousands of people. This is the war the ancient Vedic texts described, in terms which we now understand to be the use of nuclear weapons. Researchers have verified evidence of such ancient nuclear battles sites in the Middle East. Again, it appears that history may be repeating itself. After the great “sky war,” the Anunnaki eventually left Earth. The Melchizedek Atlanteans made sure the key Earth portal entry underneath the Great Pyramid was sealed and not accessible to those of the Anunnaki DNA bloodline, or their descendants. Thoth made sure of it. It is undeniable that Thoth was a very interesting link in man’s history. He was a spiritual being with great knowledge and stature. In fact, many Atlanteans would be considered giants by today’s standards, with heights between 7-8 feet tall. They towered over man both intellectualy and physically. They were called “immortal gods” not because they couldn’t die, but because they could live for several hundred years having clearly discovered the secret to longevity which is a characteristic of higher dimensional lineage. This slow aging process has been known to confuse the historical timelines if one is thinking in limited human lifespan years. This is one reason why many of these ancient stories have been explained away as myth. Much of what Thoth put in place deteriorated after his death and transmutation, but beneath the pyramids his legacy still lives on. Egyptologists will not agree with what I have to say about the Great Pyramid, but then they’ve been proven wrong countless times. This is because anything that contradicts one’s beliefs is oftentimes discarded or even suppressed. To understand Egypt and man’s true history, one has to see through a different lens. The entire Great Pyramid timeline is inaccurate. The Sleeping Prophet, Edgar Cayce, was more in line with its true construction age, which is between 11,000 – 10,000 B.C. Chamber shafts inside the pyramid are perfectly aligned with key star systems during this time frame. 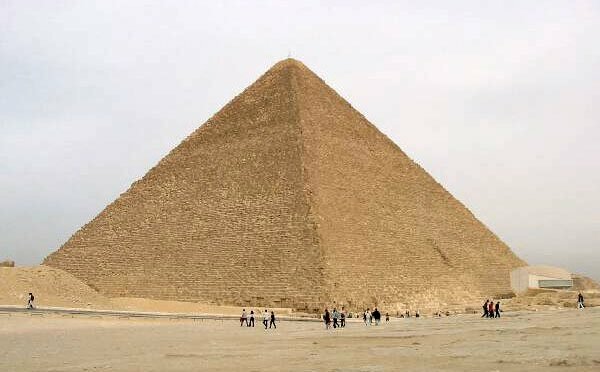 Mainstream Egyptologists would have you believe the Great Pyramid came into being around 2500 B.C., which just happens to fit quite nicely into the reign of the Pharaoh Khufu. Contrary to popular belief, Khufu (aka Cheops), a 4th Dynasty pharaoh of the Old Kingdom, was not the original builder of this great wonder. He did a great restoration job on a very old structure and no one will fault him for putting his name to it for vanity’s sake. But he did not build it. Khufu had a reputation for cultural preservation and restoration building projects. He was also widely remembered as being an unlikeable tyrant—hardly someone with the higher consciousness required to build such a celestial monument. So little is known about Khufu, that historians are even in conflict about how long he actually ruled—anywhere from 26 to 53 years. Yet, because someone found an inscription in one of the chambers inside the Great Pyramid, which mentioned a work crew named “friends of Khufu,” historians jumped to the flimsy conclusion he must have been its builder. Wrong. So who did built it? The very ancient Arab writers were convinced that the Great Pyramid was built by the Egyptian god “Thoth” (known as the Greek god Hermes, the Arabic Idris, the Hebrew Enoch, and the messenger of the gods, Mercury ). He went by many names in different world cultures, but it was the same man. So was he man or god? Perhaps a little of both. 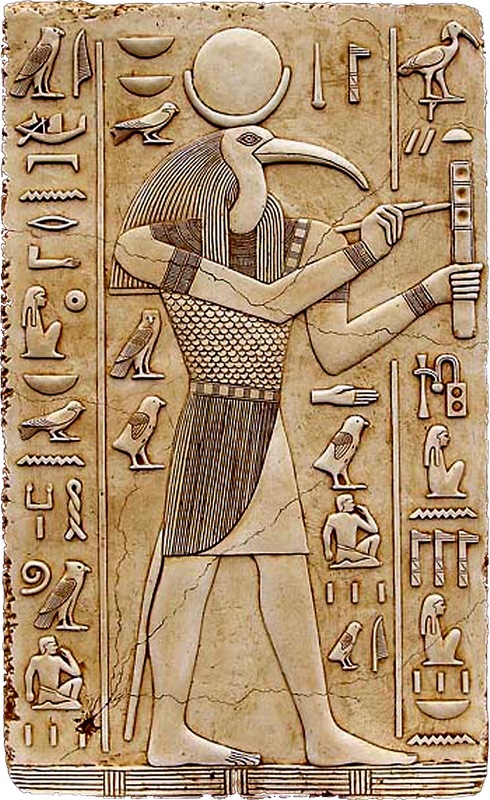 Through the centuries, the Egyptian god Thoth has held an extremely dominant place in all the sacred temples. Depictions of Thoth show him in human form with the head of an ibis—the symbol on alchemical scripts for successful transmutation. Thoth was revered as the “creator god” who brought knowledge, wisdom, medicine, sacred geometry, and the alchemy arts to Earth. This ibis-headed distinction made him readily identifiable on any temple wall. Who was he really? Thoth was the true builder of the Great Pyramid. He was one of the original elders that came to Ancient Egypt (called “Khem”) after the third and final upheaval of the continent known as Atlantis. He was entrusted by his “father,” an advanced Temple elder, to preserve the great cosmic knowledge, technology, and alchemy of the Atlanteans. Thoth’s vast knowledge of harnessing earth forces was like magic to the Ancient Egyptians who knew nothing of alchemy. To them he appeared to be a god. Like some early missionary to the native tribes, he brought knowledge of man’s true connection to the Light of Source, his origins to the stars, and how to attain the path to enlightenment and wisdom. For wisdom is power and power is wisdom. One could say that Thoth was man’s first Higher Consciousness coach. The Egyptians knew him as “one of the ten members of the dynasty of gods who ruled earth before earthly kings,” meaning he came from the Atlantean Order of Melchizedek (the cosmic priests to the priests)—highly evolved beings who reincarnated to help man during key periods in evolutionary time. Today Thoth is best remembered as the great scribe of the sacred writings called the “Emerald Tablets.” These 12 Tablets are said to be constructed in a material that is “imperishable and resistant to all elements, corrosion and acids. The atomic and cellular structure is fixed, and no change can take place, thus violating the material law of ionization.” They were translated and interpreted by a Dr. M. Doreal in 1925. How and where they were first found is still unclear. 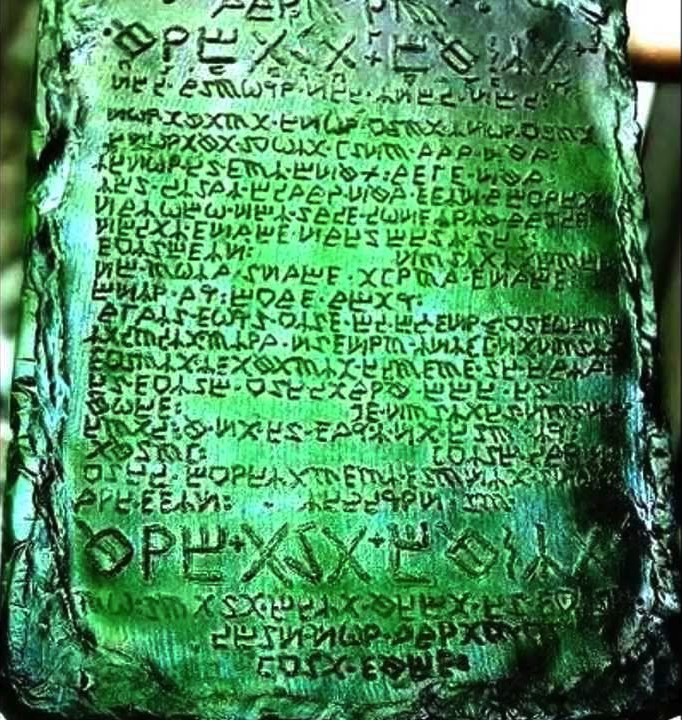 To review the writings, click here: The Emerald Tablets of Thoth the Atlantean. In these Tablets, Thoth actually reveals his involvement in building the Great Pyramid. It’s definitely worth a read. Thoth encapsulated much about the universe, the stars and mathematics into the dimensional structure of the Great Pyramid, thereby giving man a cosmic time capsule. Thoth intended that knowledge be preserved for those who would come after—those who could read the signs. The Ancient Egyptians did not just wake up one day and suddenly know what even our scientists are still learning about our world today. This knowledge was shared with them by the Atlanteans—some of it openly revealed and some hinted at, even secreted away, until man had evolved enough to be ready to use it to connect with the Divine Source. Misuse of some of this knowledge—i.e. weather manipulation, DNA experimentation, bio-engineering, and advanced weaponry led to man’s “fall into darkness,” causing the destabilization and submersion of Atlantis by those only interested in service to self. We seem to be revisiting that same trajectory pattern today. Is history once again repeating itself until we finally learn the lesson? The Great Pyramid had several purposes. It was not just a cryptic depository of universal knowledge, but it also served to magnetically stabilize the Earth’s axis and anchor it in time and space. It was intentionally built on the exact center of Earth as well as aligned to Earth’s inner core, to correct a slight wobble in its orbit caused by the upheaval of the Atlantean continental landmass. Today’s scientists have already established that Earth went through several magnetic pole reversals since pre-Ice Age time. They also know that continental drift and tectonic plate dynamics can cause strange magnetic anomalies to occur. Could pole shift have disrupted the entire magnetic field of the planet during this Atlantean time? If so, someone certainly found a way to fix it. The Earth now has an unusual magnetic grid (the 12 Earth Vortices), laid out so astoundingly uniform throughout both hemispheres, it defies natural explanation. All these vortice sites display magnetic anomalies. Scientists admit the uniformity of design could not have been naturally formed, but appears to have been somehow intentionally placed in this pattern. Cosmic alchemy at work? In addition to its function as an Earth stabilizer, the Great Pyramid was also a resonant energy generator using vibrational sound. The pyramids around the world, as well as obelisks were much like today’s electrical transmitting and receiving towers. 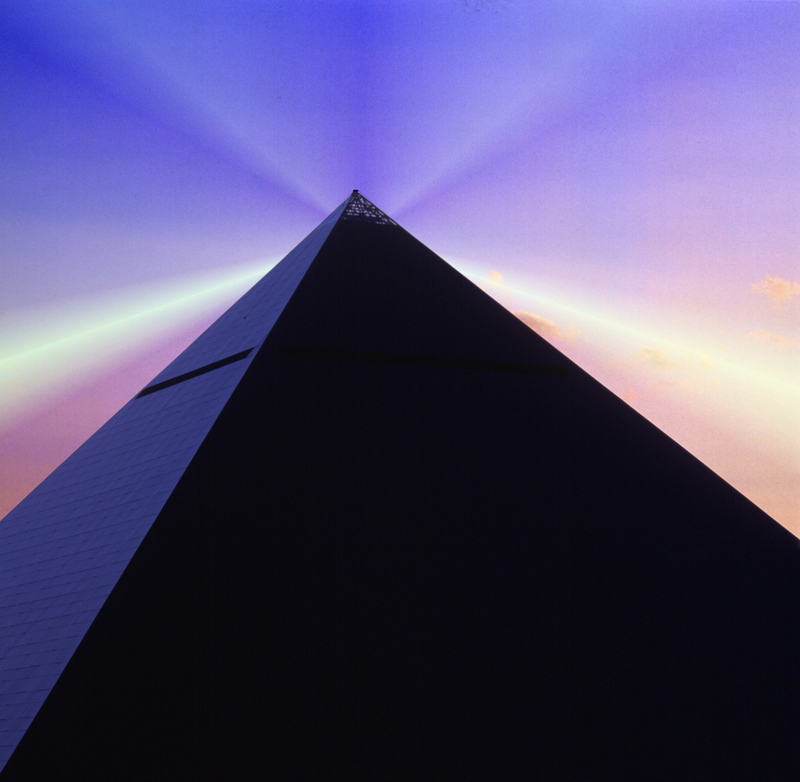 Because of this natural energy source, the Great Pyramid also became a vehicle for transmutation—transforming matter into Light Energy—the key to Soul Evolution and Higher Consciousness. This knowledge was used in initiation rites to access the Divine Will of One and transverse the cosmos (more on this in a later blog). The Ancient Egyptians, and our entire planet, have Thoth and the Order of Melchizedek to thank for all this. Is it any wonder he was thought of as a god. So what happened to Thoth? The ancient Sabaeans, who inhabited the Biblical Land of Sheba, adamantly believed that the Great Pyramid concealed the tombs of both Thoth and his father. Because of this strong belief, they came on pilgrimages to Giza right up until medieval times in order to venerate them. They said Thoth possessed the secrets to immortality. They may have been right.